Come explore the Foundations to Contact Improv with Mark Young and Samantha Letourneau. Arriving Sunday, May21st in the afternoon. Class begins on Monday morning. Final jam is Friday the 26th. Departing after breakfast on the 27th. $500Canadian includes all meals, tuition, dormitory and camping, sauna, pick-up from the Lasqueti ferry on the 21st and returned on the 27th. This is a fabulously successful workshop, material including Tai Chi, Spiral Rolls, Crescent Rolls, Aikido Rolls, exploring the rolling point of contact with a partner and how lifts and aerials happen naturally. We will have two classes per day of 3 hours each with evening jams and video material supporting discussion and exploration. This workshop is suited to all levels. The student who is new to Contact Improv will experience a full immersion in the form. Experienced dancers will be refining their skills and exploring greater flow and ease with being off balance and overcoming fear states, allowing old patterns to dissolve. Samantha Letourneau will be leading some classes during this workshop. Examine how the body is the most important filtering device in interpreting and negotiating the world externally by using principles inspired by Laban Movement Analysis and contemporary dance. By studying the relationship between the architecture of the human body and it’s pathways in physical space, it facilitates the finding of harmonious patterns and can open up movement improvisation possibilities. Learn to analyze the body in motion, and communicate through understanding your movement preferences by exploring the what and how of movement. The classes begin with breath and body-mind awareness exercises.We then explore movement including modeling movement ideas into dance/improvisation. Samantha holds a Masters in Adult Education from St. Francis Xavier University, focusing on the transformative possibilities of art engagement, a Laban Movement Analysis Certification from Donna Redlick– Certified Movement Analyst, studied contemporary dance and movement with UK-Canadian choreographer Clare Cunningham and holds an International Diploma in the Performing Arts from the School for Traditional Sundanese music and dance in Indonesia. 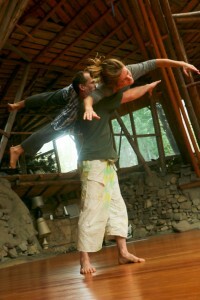 Mark Young has studied Contact Improvisation and Tai Chi for 20yrs. His approach to CI is often referred to as ‘Boot camp.’ Using physical exercises to bring us into our bodies, bring awareness to ‘what do we genuinely feel,’ we find impetus for movement based on those physical sensations. We maintain our boundaries and use them to push and launch. If lifts occur, they are mutually agreed upon by both dancers. There is communication in our boundaries. Please go to ‘Contact Us’ on the right side of this screen to send an email with ‘May’ in the subject.